Beef & parsley koftas in wholewheat pitas with apricot caramelised onion, pistachios & carrot salad. Preparation: Preheat the oven to 180°C, for the pita breads. If you would rather use the toaster, no need to preheat the oven. Prepare all ingredients as indicated above. Caramelised onion: Place a pan on medium heat with a drizzle of olive oil. When hot, add ¾ of the onion with a pinch of salt. Cook for 10 minutes then add the apricot jam and cook for 5 minutes until soft and sweet. Mini patties: Mix together the steak mince, ras-el-hanout, lemon zest and HALF the parsley. Season generously with salt and pepper and shape the mixture into golf ball sized meatballs (3-4 per person), then flatten the balls so they resemble small patties. Add a drizzle of olive oil to a pan on medium-high heat. When hot, add the mini patties and cook for 3-4 minutes a side, until lightly browned and cooked through. Salad: Mix the carrots, the REST of the parsley and the REST of the onion. Dress with lemon juice, a drizzle of olive oil and salt and pepper to taste. Pita breads: If using the oven, toast for 2 minutes, or pop them in the toaster until golden. 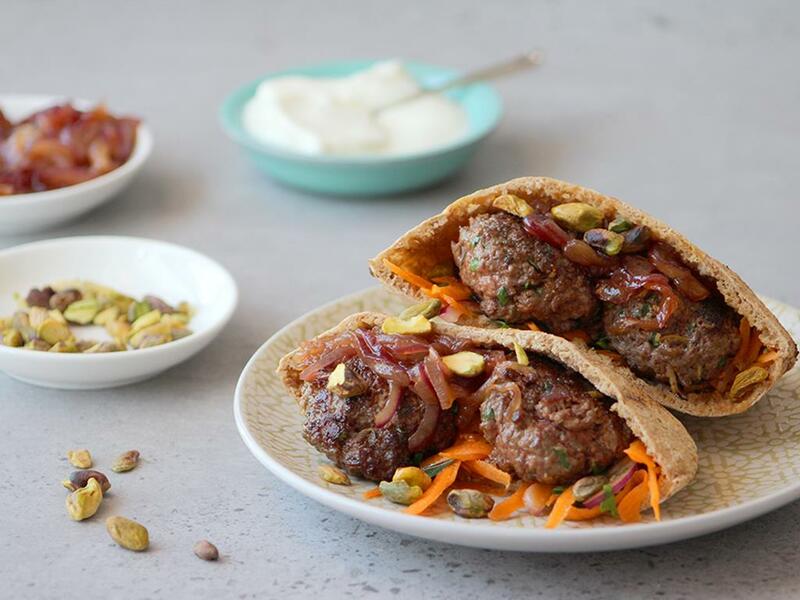 Serve the warm pitas filled with carrot salad, caramelised onion, koftas, pistachios and a dollop of yoghurt.